No matter the season, no matter the weather, you can still get on a bike every day, inside at a spin class. It’s a fun and easy way to get pedaling…no training wheels needed. If you’re looking to get in a great cardio workout, try one of these 10 awesome spin classes in New Mexico. Be ready to sit in the saddle for an hour-long cardio workout that’s challenging, exhilarating and fun. The journey doesn’t take you far in miles, but you will feel the leg burn. Classes are weekly with spinning instructors in the lead. You can set your own pace, alternating between high intensity pedaling and a little bit of coasting. This gym welcomes students of all levels, encouraging them to get the best of themselves out of the class. The cadence is fast, the climbs are steep, the downhills are high-speed and it all takes place in the safety of a high-intensity cycling class. Bikes are equipped with cycling computers and Triple Link pedals to accommodate both cleats and clips shoes. Classes are geared to build endurance, strengthen the core and tone muscles and have names like Grind, Jump Start, Pump’d, Surge, Peak, Trek, Mix’d and RMP. Getting fit doesn’t have to be a chore, it can be as fun as riding a bike. There are a number of group classes here to choose from, all great workouts designed to meet different needs. Cycle Xtreme is forty-five minutes of interval training. Cycling Express is a short, quick ride that burns mega calories. Cycling Come and Go lets you ride at your own pace. Rhythm Ride is full of heavy slow climbs, fast breaks, springs and hill work. All have motivating music blasting in the background. This small studio focuses on indoor cycling and small fitness classes that strive to motivate and inspire students to put themselves first when it comes to fitness. The spinning program is simple and easy to learn. The ride is challenging and comfortable because each student sets their own pace. Instructors are on hand to help with bike issues, but more importantly to help students get the most out of the ride. Keep calm and pedal on. That’s the mantra at this 40,000-square-foot gym. Yes, there’s an indoor track, but that’s for walking, not cycling. Spin classes daily with talented team members in setting the pace. Contracts are not required to work out here, but there is a membership fee which covers participation in all classes. The only commitment you make at this gym is to improving your fitness level. Membership are contract-free, so you pay as you go. The gym offers 24 hour a day, seven-day-a-week access, with each member getting their own key for ease of entry. 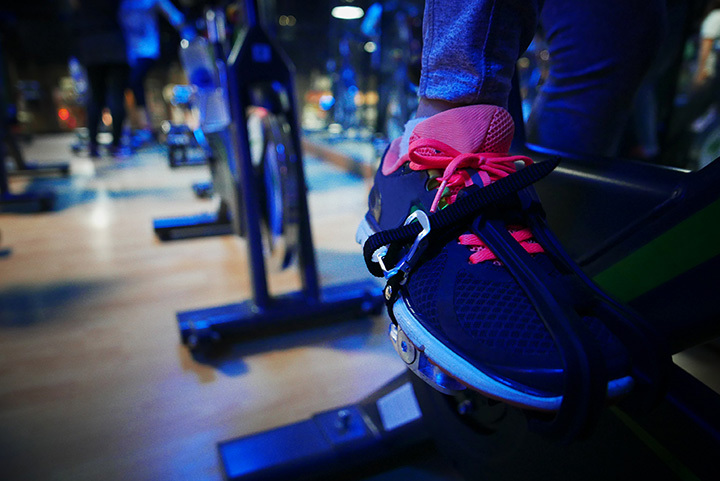 Weekly spin classes highlight core improvement, muscle strength, cardio endurance and burning calories. Supplement store on site for post workout extras. This full-service gym is open every day of the week, so there’s no excuse not to go. There’s a lot to choose from: weight training, cardio area, steam room, hot tub and outdoor pool, tennis lessons and more than 50 classes a week, one of which is spinning. There are certified trainers on-site to make sure the class takes you up and out of your comfort zone and into tip-top shape. Get your legs going a couple of times a week at the indoor spinning class here. All levels are welcomed and encouraged. You’ll ride to the rhythm of exciting music tracks choreographed to provide an excellent workout and improve cardiovascular conditioning. Open 24 hours a day, every day of the year. After a spin, stop by the salon for a pedicure. Ever been to a rave? You’ll be part of one here at the spin class. The upper body moves get you up and out of the saddle. You’ll be sweating to the rhythm of high energy music, beating out the cadence. It’s a dance party on a bike. Instructors help adjust seats, handlebars and pedals to ensure a trouble-free workout. Classes are intense and are designed to boost metabolism and improve overall fitness. As the only official Spinning facility in town for more than 20 years, the program here delivers the ride of your life. Whether you want to just have fun, lose weight, improve health or get ready for your first Century ride, there’s a class for you from a 60-minute workout to interval training to heart-rate focused spinning to better leg strength to a bodyblade blast that incorporates spinning and off-the-bike upper body training. Workouts every day of the week.